Right, ok, there aren’t too many notorious historical figures that could be given a comical makeover for the benefit of selling an online slot but unfortunately for former French Emperor Napoleon Bonaparte, he is one of the few. Online slot developer NextGen Gaming is poking a fair bit of fun at Napoleon on this slot and you won’t see too many British players moaning about it given Napoleon’s constant obsession with trying to invade the isles. This is a 5 reel, 25 pay-line slot where a bunch of skeletons play the role of a cartoon Napoleon and a range of other characters. The reels are packed with various characters and symbols relating to the maritime era that the real Napoleon ruled, except there’s a definite skeletal twist to proceedings here. Symbols include a skeleton dame, a skeleton army, a skeleton ship and a treasure map. There are also the standard 9 through to Ace symbols to bulk up the reels. 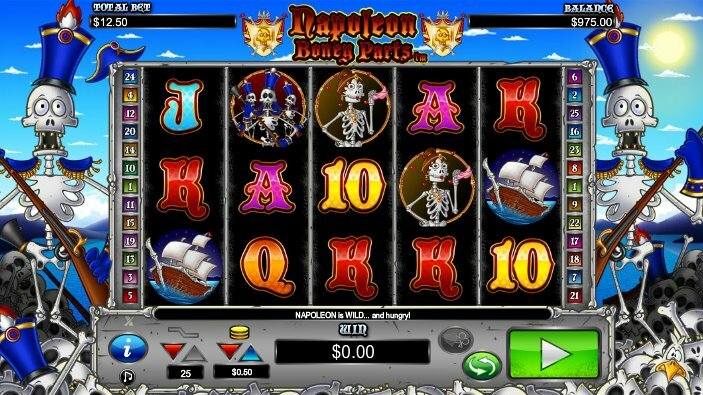 The Napoleon Boney Parts character acts as the Wild and substitutes for all other symbols except for the Scatters to complete winning combinations. He is also the key to triggering the Boney Parts Bonus if you hit him on reels 2, 3 and 4 at the same time. On this bonus feature, you must pick out three bones from Napoleon Boney Parts skeletal body. Each bone you pick will reveal a prize and if you manage to pick out the right bones to force Napoleon’s skeleton to collapse then you will win a bumper jackpot prize. There is also a free spins bonus round that can be triggered if you hit three or more of the golden shield Scatters across the reels. It is possible for you to win up to 10 free spins with a 2x multiplier on the free spins bonus round. This is a nice little release from NextGen Gaming. They are well known for their more light-hearted slots with the satirical take on gangsters The Codfather slot and the frisky Foxin’ Wins slot both being prime examples of this. Napoleon Boney Parts is a breath of fresh air though and the Boney Parts Bonus brings a new meaning to the term “Pick ‘em Bonus”. It’s also always pleasing to see a free spins bonus round with a multiplier involved. This is definitely a slot I would recommend you give a go.